An American computer scientist who co-founded the Association for Computing Machinery (ACM) in 1947. He was also a social activist who worked to achieve conditions that might minimize the threat of nuclear war. He received a BA in Mathematics and Logic from Harvard in 1930. He pursued a career as an insurance actuary at Prudential Insurance from 1934–48, except for service in the United States Navy during World War II. 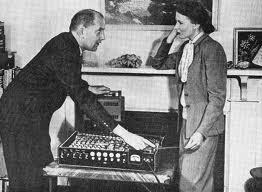 He saw George Stibitz's calculator at Bell Laboratories in 1939, and the Harvard Mark I in 1942. In November, 1946 he drafted a specification for "Sequence Controlled Calculators for the Prudential", which led to signing a contract with the Eckert-Mauchly Computer Corporation in 1947 for one of the first UNIVAC computers. Berkeley left Prudential in 1948 to become an independent consultant when the company forbade him to work on projects related to avoiding nuclear war, even on his own time. He sometimes wrote using the pseudonym "Neil D. MacDonald". He became famous in 1949 with the publication of his book Giant Brains, or Machines That Think in which he described the principles behind computing machines (called then "mechanical brains", "sequence-controlled calculators", or various other terms), and then gave a technical but accessible survey of the most prominent examples of the time, including machines from MIT, Harvard, the Moore School, Bell Laboratories, and elsewhere. In Giant Brains, Berkeley also outlined the first personal computer, Simon. Plans on how to build this computer were published in the journal Radio Electronics in 1950 and 1951. Simon used relay logic and cost about $600 to construct. The first working model was built at Columbia University with the help of two graduate students. He founded, published and edited Computers and Automation, thought to be the first computer magazine. He also created the Geniac and Brainiac toy computers. He is the author of several publications including, but not limited to: Giant Brains, or Machines That Think (1949); Computers: Their Operation and Applications (1956); Symbolic Logic and Intelligent Machines (1959); Probability and Statistics: An Introduction through Experiments (1961); The Computer Revolution (1962); The Programming Language LISP: Its Operation and Applications (1964); and A Guide to Mathematics for the Intelligent Nonmathematician (1966).